India denied England opener Alastair Cook a dream century in his farewell Test as he was dismissed by Jasprit Bumrah for 71 on the first day of the fifth Test against India at the Oval on Friday. The 33-year-old looked all set for his 33rd Test century, as England went into tea at 123/1, with Moeen Ali (23*) giving him company. But the Indian bowlers, who were having a largely luckless day, turned the match around after the break with three quick wickets. Cook, who was dropped on 37, played on to Jasprit Bumrah. England's top run scorer and former skipper, Cook was given a huge ovation as he walked back to the pavilion. He could still get a chance to post another century in England's second innings. England were 134/4 in the day's final session after skipper Joe Root was dismissed lbw for a duck three balls after Cook's dismissal. 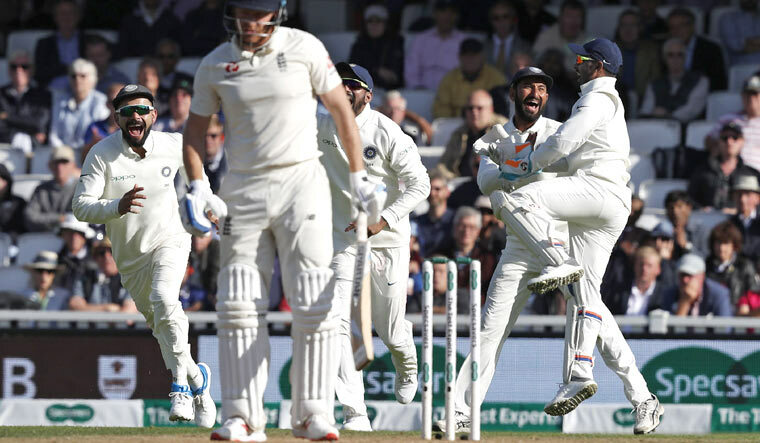 Jonny Bairstow continued his woeful form edging Ishant Sharma to wicketkeeper Rishabh Pant for yet another duck. Moeen Ali (33*) and Ben Stokes (2*) were at the crease. Cook and Jennings (23) put on a 60-run partnership for the first wicket—the highest opening partnership in the series for either sides—before the latter was dismissed by Ravindra Jadeja. England were 68/1 at lunch but lived dangerously as Bumrah, Sharma and Mohammed Shami repeatedly beat the bat. Cook was squared up by Sharma but Ajinkya Rahane failed to cling on to a low catch. Moeen Ali, too, got a life when swiped at Bumrah and the ball flew to Virat Kohli at third slip but he spilled it. Earlier, England captain Joe Root won the toss and chose to bat. The hosts have an unassailable 3-1 lead in the five-match Test series and are looking to end it on a high with a win in what is Alastair Cook's last match. Cook announced his retirement after the Southampton Test. He would continue to be associated with Essex County during the coming season. England fielded an unchanged squad for the final Test. India, on the other hand, made some changes to their playing XI, bringing in debutant Hanuma Vihari and Jadeja. Ravichandran Ashwin and Hardik Pandya were rested.